The EasyUSB AudioBRIDGE Analog Audio to USB Converter from Vaddio is a professional analog audio to digital audio USB 2.0 converter. The unit features a balanced and or an unbalanced audio source equipment input and output. The analog audio input is converted into a digital USB format making it compatible with common video conferencing software. The AudioBRIDGE is compatible with pro audio conferencing DSP mixers with echo cancellation as well as audio equipment without internal echo cancellation. The converter USB 2.0 port uses universal audio class (UAC) drivers and connects to any PC with UC client software. An 8-position DIP switch provides configuration settings of the unit. The AudioBRIDGE includes independent USB and analog gain stages. The gain structures can be configured between the pro audio equipment without being impacted by PC volume controls. 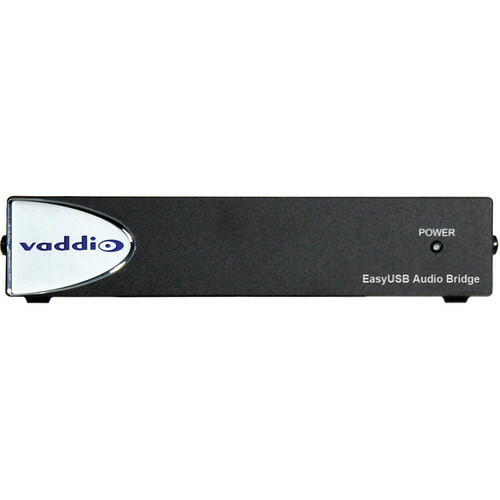 Additionally, the AudioBRIDGE includes an RS-232 serial control port for use with AMX/Crestron control systems. Box Dimensions (LxWxH) 16.1 x 9.5 x 3.4"